The demand for the high quality pico projectors with reasonable price, use of pico projectors in consumer electronics are some of the key influencing factors of the pico projector market. The pico projector market was valued at USD 1.28 billion in 2015 and is expected to grow at a CAGR of 14.52% between 2016 and 2022. The base year considered for study is 2015 and the forecast period is between 2016 and 2022. The objective of the report is to provide a detailed analysis of the pico projector market based on type, technology, specification, components, applications, and geography. The report provides detailed information regarding the major factors influencing the growth of the pico projector market. 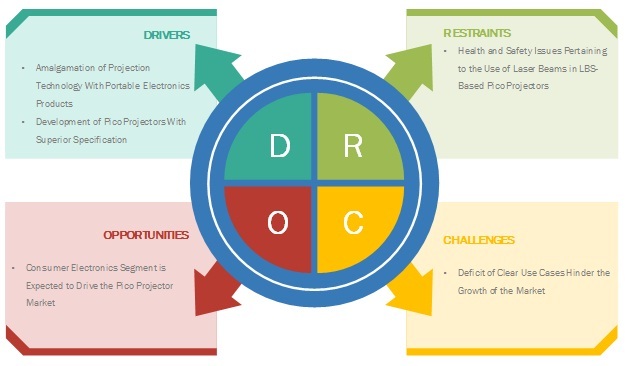 The report also gives a detailed overview of the value chain in the pico projector market and analyzes the market trends on the basis of the Porter's five forces analysis. The projection module is a vital component of any pico projector. The advancement in technology has led to the development of better projection modules and light sources. Thus, projection modules have become compact and employ light sources, such as LED which offer more brightness per watt. Technological advancement have further led to a reduction in the size of pico projectors as well as their power consumption. Hence, even pocket-size pico projectors have entered the market and the integration of pico projectors into consumer electronics, such as tablet and mobile devices is the prevailing trend in the market. The pico projector market has also witnessed the introduction of some add-on devices, which could be combined with smartphones and similar devices to enable them to work as pico projector. For instance, Moto Insta-Share projector is exclusively designed for Moto Z smartphones, while MobileCinema i60 from Global Aiptek Corporation (Taiwan) is a highly compatible compact projector for Apple iPhone 6 and iPhone 6s. Moreover, MobileCinema i60 is also compatible with other HDMI-supported devices. In September 2015, Lenovo Group Ltd. (China) had also launched the Lenovo Yoga Tab 3 Pro (a 10.1 inch tablet) with a pico projector of 50 Lumen, which is able to project a 60 inch picture diagonally. Lenovo already has a wide array of products such as embedded projectors. Other consumer electronics giants, such as Apple, Samsung, LG, and Sony are yet to enter the embedded projectors category. However, Sony and LG do have a significant presence in traditional projector segment. The research methodology used to estimate and forecast the pico projector market begins with capturing data on key vendor revenues through secondary research, such as company website, investor presentations, consumer electronics show (CES), and leading market players’ newsletters. The vendor offerings are also considered to determine the market segmentation. The bottom-up procedure has been employed to arrive at the overall size of the global market from the revenue of key players. After arriving at the overall market size, the total market has been split into several segments and subsegments, which has been verified through primary research by conducting extensive interviews of people holding key positions, such as CEOs, VPs, directors, and executives. The market breakdown and data triangulation procedures have been employed to complete the overall market engineering process and arrive at the exact statistics for all segments and subsegments. The pico projector ecosystem comprises component providers, OEMs, technology providers, and distributors. Texas Instruments Inc. (U.S.) and Microvision Inc. (U.S.) are key technology suppliers in the pico projector market. The key suppliers of pico projector include Aaxa Technologies Inc. (U.S.), LG Electronics, Inc. (South Korea), Koninklijke Philips N.V. (Netherlands), Lenovo Group Ltd. (China), and Optoma (Taiwan). In October 2016, AAXA Technologies Inc. has launched HD pico projector with 720P native resolution. It is a cube-shaped pico projector having the weight of 0.37 pound. It is based on LCOS technology which can deliver the image up to 80-inch screen size diagonally. Thus, the company has strengthened its product portfolio with this tiny cube-shaped pico projector. LG Electronics Inc. launched PH450U portable pico projector in IFA 2016, Berlin trade show. It is a DLP-based pico projector with 450-lumen brightness. It supports wireless connection via Bluetooth or Wi-Fi through Miracast. With the launch of PH450U, the company expands its Minibeam series of portable projectors. In June 2016, Motorola Mobility LLC (U.S.), the subsidiary of Lenovo Group Ltd., launched Moto Z smartphone along with its Moto Mods accessories. Moto Mods include the portable projector which can be connected to the series of Moto Z smartphone. Thus, the portable pico projector helps to display the smartphone content onto a large screen. In March 2016, Koninklijke Philips N.V. launched a new pico projector from the PicoPix family. With 170 lumens of brightness, it can project images or videos diagonally up to 120 inch. Screen mirroring function compactible with Android, iOS, and Windows operating system helps the user to share the content from smartphone or tablet without the need for wire. This study answers several questions for the stakeholders, primarily which market segments to focus on in the next two to five years for prioritizing efforts and investments. This research report categorizes the global pico projector market on the basis of type technology, offerings, components, specification, applications, and geography. 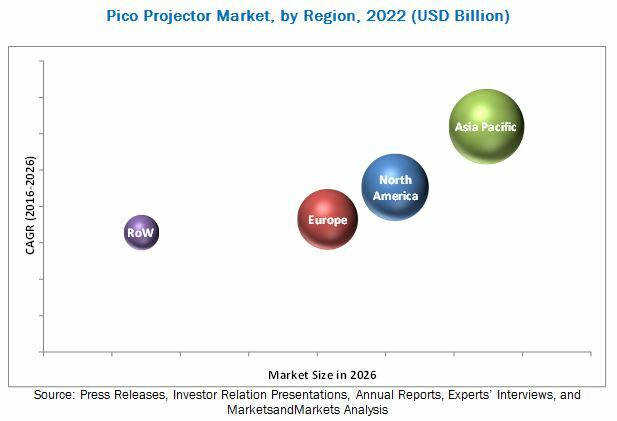 The pico projector market is expected to reach USD 3.44 billion by 2022, at a CAGR of 14.52% between 2016 and 2022. The growth of the pico projector market is propelled by the integration of projection technology with portable electronic device, and introduction of pico projectors with superior specification. The pico projector market has witnessed a number of launches of non-embedded pico projector in the recent past. These devices are equipped with better design than their earlier version in term of great brightness output, multiple connectivity options, and vivid picture quality. Considering these factors, the market for non-embedded pico projector is expected to exhibit the highest growth rate than embedded pico projector. Digital light processing (DLP)-based pico projector holds the largest share in the pico projector market. DLP is an advanced projection technology developed by Texas Instruments, Inc. (U.S.). DLP is one of the finest technologies in the field of projection and near-eye display, and also well implemented in pico projectors. Cinema and conventional projector is also based on DLP technology, hence this technology provides excellent results in the pico projector as well. On the other hand, laser beam steering (LBS) is an emerging technology in the field of projection engineering and is patented by MicroVision, Inc. (U.S.). LBS provides focus-free setup and vibrant picture as compared to other technologies at comparable brightness level. Pico projectors with 480p resolution were introduced in the market at an early stage of pico projector development. Pico projectors with 480p resolution are considered as value-for-money products, therefore, this category of products holds the largest market share. However, the demand for high-quality image projection would lead to the increased market share for pico projector with 720p resolution which offers HD standard display. Consumer electronics is expected to hold a large share of the global pico projector market and both embedded and non-embedded pico projectors would be used in the consumer electronics segment. End users prefer to use pico projectors owing to the ease of connectivity (with smartphone, gaming console, and laptops), compact size, and attractive price offerings. The business and education segment accounts for the second largest share of the global pico projector market. APAC holds the largest market share in the global pico projector market and is also the fastest growing market led by China, South Korea, and Japan. Likewise, for other consumer electronics products, APAC is also a manufacturing center for pico projectors owing to easy availability of requisite components. The presence of a high number of young end users and a demand for handy gadgets makes APAC the largest pico projector market. Many startups along with some consumer electronics giants engaging in the development of pico projectors belong to the APAC region. Retailers can tap the power of projection technology and explore the application of pico projectors. They could use pico projectors to display a wide range of products and related information digitally on a screen or wall at various customer touchpoints in the supermarket. Pico projectors could be used as an integral part of advertisement, which allows retailers to display marketing contents on a wall, ceiling, or even the floors of supermarket. The pico projector can be used to display the videos, text, and images. These features would help the retailers to engage the customers for a longer time as well as create awareness about the ongoing and upcoming offers and deals in supermarkets. Pico projectors are a perfect match for those professionals who are frequently give business presentations to a group of people. Pico projectors are portable in size and could be easily carried everywhere, thus making the projectors most suitable for sales professionals who travel frequently. Civic organizations, government body use pico projectors for briefing and informing people about ancillary information at meetings. Pico projectors are the best alternative for the traditional chalk and board education method. These projectors help to improve the teaching standards by providing more scope to teachers. Teachers can include images, videos, as well as speeches through the use of pico projectors. With the help of pico projectors, the teachers could access the internet over their smartphone and display the content on a larger screen size. The use of pico projectors do not require a personal computer like traditional projectors. Teachers can simply use their smartphones and tablets and connect it with the pico projector by a wire (HDMI and USB) or wirelessly (Wi-Fi and Bluetooth) and share the study material in convenient manner. They can directly plug in the storage devices such as pen drive and memory card into the respective slots of the pico projectors. Thus, the use of pico projectors in classrooms makes the learning and the level of engagement more interactive. Where will all these developments take the application in the mid to long term? Which region is leading in pico projector market? The major restraining factor is the adverse effect of laser beams on the eyes, which may raise concerns with regard to health and safety of the consumers. The ANSI/FDA in the U.S. and the IEC international safety standards introduced certain regulations which restricted the power output of the laser source affecting the picture brightness in LBS-based pico projectors. The key market players, such as Texas Instruments, Inc. (U.S.) and MicroVision, Inc. (U.S.) are focusing on new product launches, to enhance their product offerings and expand the reach of their projection technology to many pico projector suppliers.